The GOG.com version includes the expansion Queen of the Nile: Cleopatra, the latest patch and is fixed to run on modern computers. Only for 16bit colour depth desktop. Hackable for 32bit see Windowed. For Pharaoh without Cleopatra replace Pharaoh.exe with this file. For Windows 8 and newer, enable the following compatibility settings for the Pharaoh.exe file (located in <path-to-game>: Reduced color mode (16-bit color). 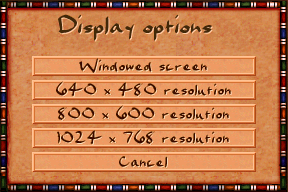 For Windows Vista and 7, change the colour mode through the Screen resolution settings in the Control Panel. For Windows XP, change the colour mode through the Display settings in the Control Panel. Download the patched files and extract them into <path-to-game>. An application that automatically changes the colour depth to 16-bit and starts Pharaoh in a window. After the game is closed the color depth returns to 32-bit. Extract the contents of the download to <path-to-game>. 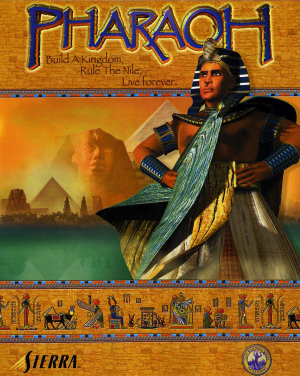 Run the game using PharaohStarter.exe. Sliders for Music, Speech, Effects and City Ambient. 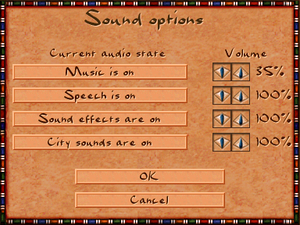 Enable the following compatibility settings for the Pharaoh.exe file (located in <path-to-game>: Compatibility mode (Windows 2000). 4. Save the file with the .bat extension and place it in <path-to-game>. 5. Run this file to launch the game. In <path-to-game>, rename the mss32.dll file to oldmss32.dll. Download Miles Sound System (MSS) v6.0m. Hopefully this fixed your problem as it did me. Play and enjoy! ↑ 2.0 2.1 File/folder structure within this directory reflects the path(s) listed for Windows and/or Steam game data (use Wine regedit to access Windows registry paths). Games with Steam Cloud support may store data in ~/.steam/steam/userdata/<user-id>/564530/ in addition to or instead of this directory. The app ID (564530) may differ in some cases. Treat backslashes as forward slashes. See the glossary page for details. ↑ Instructions from the Sold Out Software release. This page was last edited on 17 April 2019, at 11:29.